This is a complete set adapter for FWH/LPC chip. It covers all common regular FWH/LPC flash chip packages. 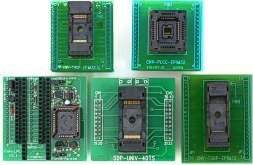 They are all profesional ZIF version adapter. It is backward compatible with Willem programmer's FWH/HUB adapter. It supports both True USB as well as parallal willem programmer. A PLCC32 socket type FWH/LPC adapter(ADP-030 with TSOP32, TSOP40 sockets). A PLCC32 ZIF adapter (ADP-062). A TSOP32 14mm ZIF adapter (ADP-022). A TSOP32 20mm ZIF adapter (ADP-021). This adapter set is for True USB/Standard/Enhanced Willem EPROM programmer.